We went out last night. Oh did we go out last night. Or so I assumed. 10 minutes into the dinner, Flora, one of the fairly higher-ups in the Sales/MKT department, announced that she couldn't drink because she was pregnant. And with that announcement came the first round of baijiu. Then Steven, one of the owners, realized that he really likes baijiu. 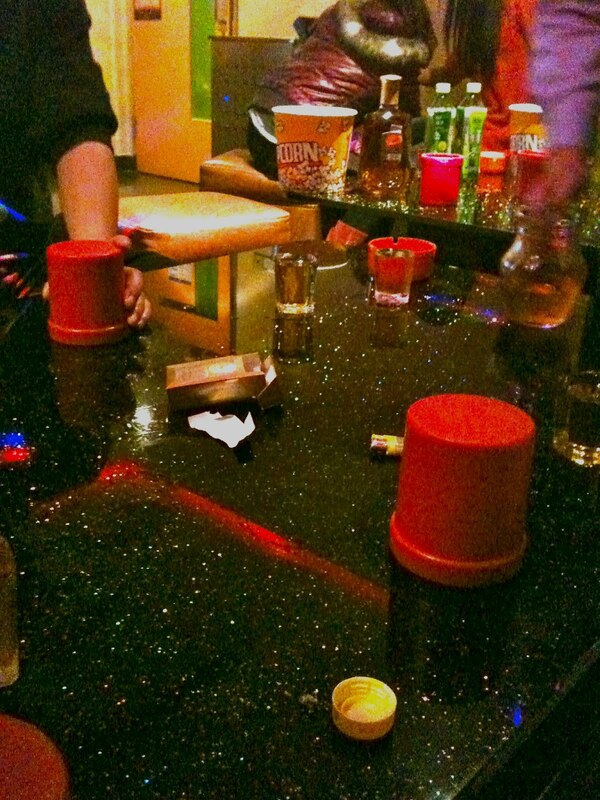 And consequently more rounds of baijiu were done. By this time, we'd all had around 5-6 shots of this 50% by volume concoction. It should be noted that Steven, a 40-something year old (I guess 47-48 year old, as he is also Year of the Dragon), was by far the most legendary baijiu drinker I have ever seen. It was like a child at dinner wanting ice cream...every five minutes I would just hear "Baijiu! Baijiu! Baijiu! ", and a round would be poured. And he would always just down it like an absolute champion. A brief aside about baijiu--it is the most feral beverage known to man. That is to say, it tastes as though you're drinking tequila mixed with vodka mixed with gin mixed with urine mixed with radiation--it is horrendous. The best quote I ever heard about baijiu came from the book Mr. China by Tim Clissold. He says something to the effect of "every time I go out with Chinese businessmen and have too much baijiu, my wife tells me I smell like an oil-soaked rag the next morning". Yeah, it's that appetizing. So anyway! After a dinner that included a lot of baijiu, beer, Chinese food, and Chinese people smoking indoors, we headed down the street to KTV. Where it got very messy. The two company owners immediately ordered an array of food, as well as several towers of whiskey and green tea (a wonderful combination when preparing for a hangover, the antioxidants in the green tea work wonders, really!) And the dice came out. 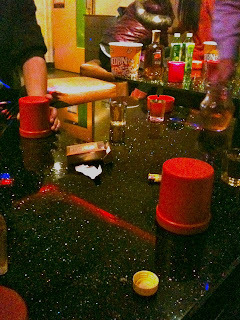 A popular Chinese dice game, particularly at KTV--basically, everyone gets a cup and 5 dice. You put the cup over the dice (as the picture shows) and shake the cup to roll the dice. You then say some number of some number, i.e. there are five 6's. This number indicates the number of 6's you think that everyone has, combined. 1's are wild. Whatever number you say, the person after you must either increase the first or the second number (i.e. if I say there are five 4's, next person must either say five 5's, five 6's, or six+ of anything). Anyway, if someone thinks you're bluffing, they call you out. If they're right, you drink. If you're right, they drink. It will always, 100% of the time, without fail, end in tears. And so it did. So after about 2 hours of drinking and karaoke (I did indeed end up singing a few songs, though to be entirely honest I have absolutely no recollection of what any of them were), we called it a night. And just to emphasize that no, I was not a lonesome raging alcoholic, on the walk out of the KTV bar, someone mentioned that they didn't know where Jacky, my boss, the company's #3 guy behind only the brothers Jin, the head of the entire Sales/Marketing department was. We ended up going into a side room to find him passed out on the couch, with a puddle of vomit at his feet. Like the absolute legend that he is. A brief aside--he ended up rolling into work at 8:59am this morning, as he is well within his rights to do. But I digress--Jacky was passed out, so I literally carried this Chinese man out of the bar and into a cab. So anyway, that's the photo of the day, and the story behind it. Lessons learned--drink green tea with your baijiu and whiskey. Make sure to set an alarm before going out (which I did, and was consequently early for work this morning despite still being somewhat drunk...though excusable given that everyone at the dinner/KTV needed to have a drink with the token laowai. And given that the last major event of last night was carrying my boss from the fetal position into a taxi, I feel like it's fair enough. Work has been picking up a lot lately (this being in spite of the fact that I'm currently writing this at work). But yes, US show season is coming up, so we've been doing a ton of work on catalogs, marketing, and general sales planning, it just so happens that I had an extra 20 minutes this morning to throw this gem out into cyberspace. That's about all for now, more poor-quality photos to come.